After helping a Spanish researcher locate the Paco Cemetery, I was curious about one of Manila's attractions that I had no recollection of visiting before. A friend who grew up in that area told me that it was a popular rendevous for romantic couples. I had read that they held concerts at the park and that it is a popular venue for weddings. Not too long ago I was staying at a relative's house on Taft Avenue which was just a few blocks from the cemetery. One morning I strolled over to visit. 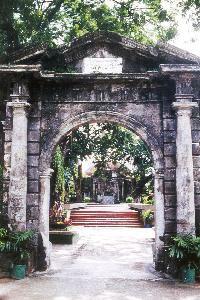 The cemetery is located where Padre Faura and General Luna Streets come together. It can be reached by foot from Rizal Park. The gate is across a busy street in front of the Paco Fire Station. No longer an active cemetery, it has been a National Park since 1966 and they charge a small entrance fee. The original plan was for the cemetery to be octogon-shaped (see The Mystery of the Octogonal Cemetery). What was finally built around 1820 were two circular concentric stone walls with three levels of built-in vaults in a Romanesque style. Most of the vaults, which originally had a 3-year renewable lease for P20, stand empty though many are mysteriously sealed but unmarked. A few are still in use for their original purpose with engraved monuments. The cemetery was once the burial place of some notables including the national hero, José Rizal, and the three martyred priests of the Philippine independence movement. Today, the Spanish Governor-General Solano is the only known luminary still buried here in the chapel. The hub of the cemetery is a raised fountain which aligns with the gate and the nave of the domed chapel in the back. In the evening, the fountain is lit by multi-colored lights creating a dancing rainbow. Most of the grounds are shaded by large trees. White pigeons flitted between the branches and the roof of the chapel. Steps to the top of the inner wall leads up to a raised promenade that encompasses the park. Catholic Mass is celebrated at the Chapel of St. Pancratius on Sundays and the chapel is popular for weddings. I was curious about the saint whose name sounds like a vital organ that you would never want to hear about from your doctor. It also sounds Roman and, sure enough, Pancratius (or Pancras) was one of the early Christian martyrs from around 300 A.D. when Jesus worship was still considered a forbidden cult by ruling authorities. There are no hard historical facts about Pancratius but legend says he was an orphan who was killed at the age of fourteen for embracing the faith. The first church of England was dedicated to St. Pancratius and he is considered the patron of children, against false witness, and headaches. His feast day is celebrated on May 12. The chapel was closed the morning I was there. There were a few students who lingered awhile near the fountain but when they left, the place was empty except for a few groundskeepers. The double walls and trees filtered out much of the outside noise. It was easy to forget that you were in the middle of a bustling city. In the solitude, I could imagine the mood of the place changing with the days and hours. On Saturday afternoons, families would gather for picnics with boisterous kids chasing each other around the walls playing hide-and-seek. On Sundays, wedding parties would fill the chapel with brides in gowns and lace and grooms in their barong tagalog. On Friday evenings as the sun retreats, trysting lovers pause in the darkening shadows.